Schools in southern Israel close as rocket attacks continue for the seventh day straight. Gaza terrorists continued their assault on Israel on Thursday night with a Grad missile fired at Ashdod. While the Iron Dome system successfully shot the missile out of the air before impact, the attack caused concern among local officials and led to the closure of schools across the south. Another two rockets were fired later in the evening, and led to further school closures. The rockets, of the Gaza-produced “Kassam” variety, hit non-populated areas and did not cause injuries. Schools in Ashdod, Ashkelon, Be’er Sheva, Ofakim, Omer, and Gan Yavne are closed Friday. In Gan Yavne only, twelfth-grade students will have classes held in special rocket-protected rooms. The latest terror onslaught from Gaza began last Friday. 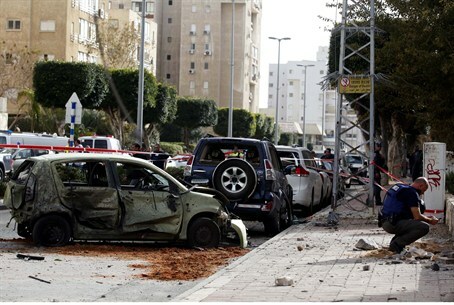 Terrorists fired more than 200 rockets at Israeli cities in three days. Military experts noted a dramatic development in rocket fire compared to previous rounds of heavy bombing. Terrorists have fired many more medium-range missiles, targeting major cities in the south. However, they have not yet fired long-range rockets that could reach central Israel or the Jerusalem area. On Monday evening, a theoretical cease-fire was reached; however, attacks continued Tuesday and as of Friday have not stopped.